Let's face it, we have all had instances where we want to change our hair styles. There's many of us who opt for curls but when it comes to curls if not done with the correct tools they may end up going flat. Nothing worse than being out or at any event and your hairstyle taking a completely different form. 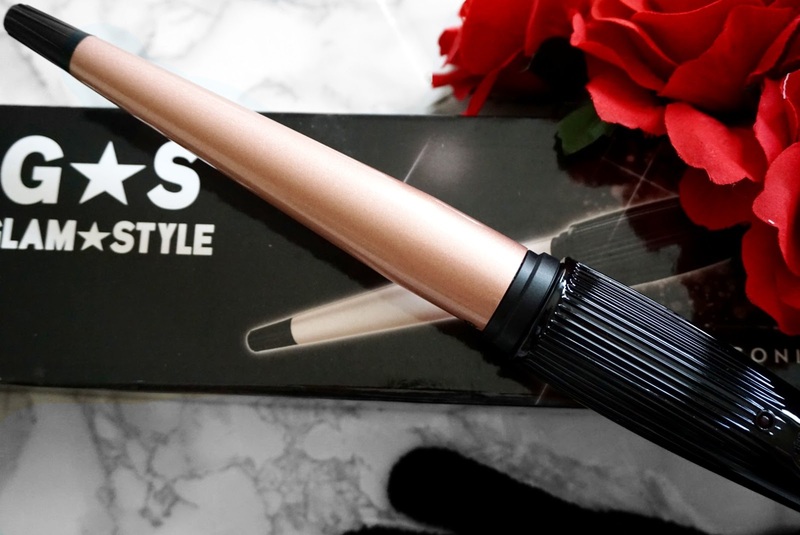 The Glam&Style Curling wand might just be the tool for you. You may ask yourself why would I need a curling wand when I have a curling iron? Well it's very simple. First of all, this particular curling wand is fantastic as it has a conical shape and it has a ceramic coated barrel to ensure healthy looking curls. Second of all, it heats to an optimal temperature of 200℃ in a fraction of a time, so when you actually utilise it you will notice how quick it is to get your curls. Omg, 200℃ sound like a hell of heat to subject hair to, I do recommend using heat protective sprays prior to usage, but also note that, that temperature is not to hot when it come to stylers, hence your hair will not suffer as much damage as it would with some other stylers. I mean who would want to end up like that famous Youtube girl who burn off her hair at the start of her curling wand hair tutorial. This means that the appliance was extremely hot beyond temperatures hair could handle. Glam&Style are so confident in their product that not only do they provide a 2 year warranty, but they also have a money back guarantee if you are not satisfied. Let's be realistic would companies offer money back if they knew that their appliance wasn't worthy? Definitely not, it wouldn't be an ideal money maker but rather a fall pit. When it comes to curling irons, you have to subject your hair to higher heat exposure as it takes longer for it to form the curl. This process also takes much longer and curl will not look as defined. I love that it is very easy to use as it has an off and on sliding lever and it is in ROSE GOLD. It also comes with a 2 metre anti-kink swivel cord, a loop to hang it with and even a protection glove. How practical. Let me get right into it, the best way to create beautiful curls is by simply wrapping your hair around the barrel for a few seconds and then slowly releasing it. You may have noted that the barrel is conical which is ideal for creating different curl styles. The thinner end ensures tight curls and the thicker top ensures loose curls. Depending on how defined or soft you want your curls, the amount of sectioned hair you use is very important. Tight curls are achieved by doing thin sections and loose ones are achieved by selecting thicker sections. Yes, it is as simple as that. For a soft look do brush the curls out either with a paddle brush or your fingers. However, if you do have extremely heavy or straight hair and curls tend not to easily keep their form, you may wish to hold your curls with bobby pins or even hair rollers. Set your curls with hair spray at the end. This item retails currently at £14.99. 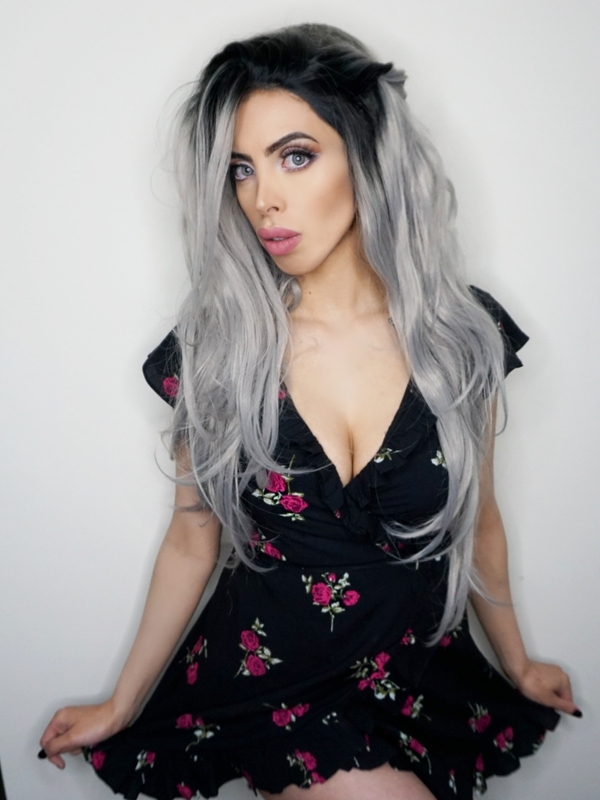 This below is the look I created with the curling wand. I have long hair and the whole process took me no longer than 10 minutes. All I did was section my hair and instead of curling thin strands I made sure I curled thick part to get a very natural yet wavy look. To finish it all off, i simply brushed it through with a paddle brush and put some hairspray in. 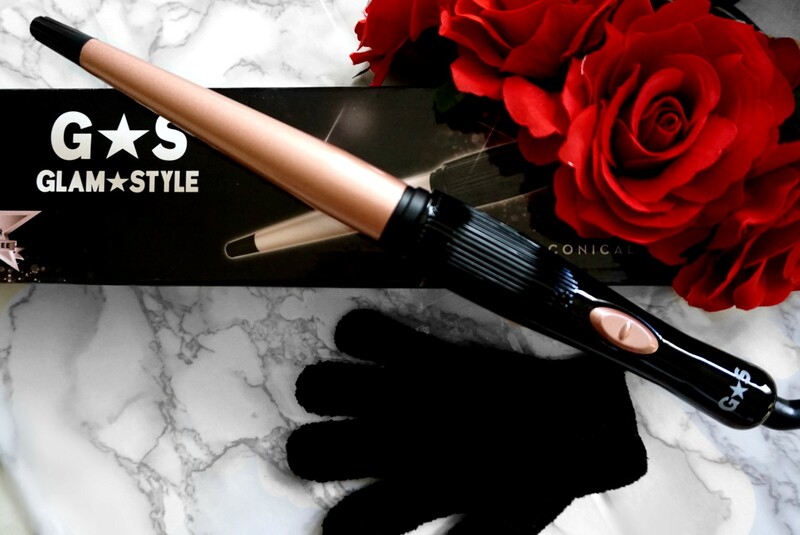 I really enjoyed using this wand and recommend it if you are looking for value for money. I do love the design too, however obviously for the price point in question you will be getting a basic on and off click switch. 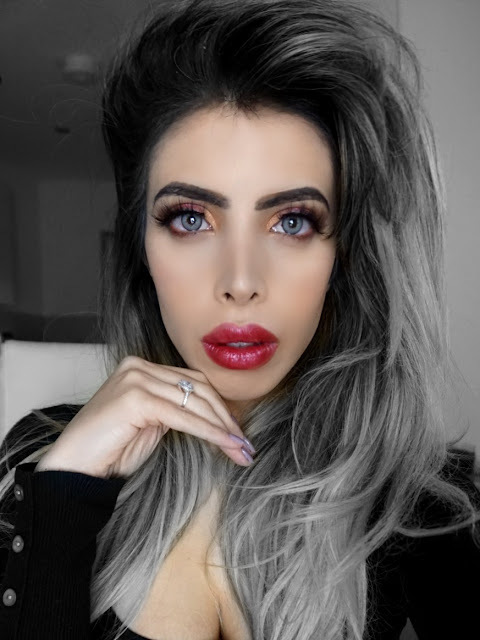 What did you think of this product and my look? Let me know down below, would be great to receive some feedback. I received this product complimentary for review purposes. All opinions are always truthful and my own. Everybody has a love and hate relationship when it comes to Valentines Day and let's face it most women are probably already looking forward to it. Great preparation is put into it , at least from my perspective. Number 1 concern, what to wear? What hairstyle to go for? 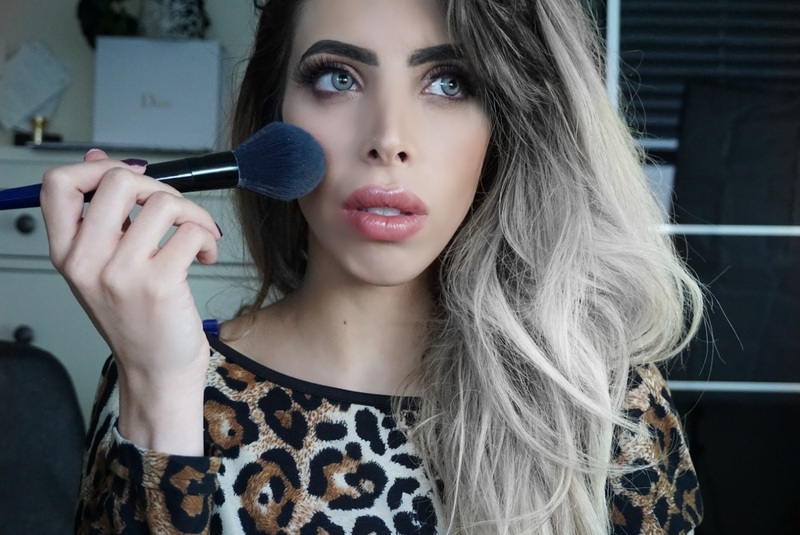 What makeup look will suit what I will wear? What gift choice to go for, for your partner? I am going to focus on an outfit inspiration for Valentines Day taken from www.motelrocks.com , I was given a choice of dresses to choose from and I went for what caught my eye the most. Since, Valentines day is coming soon, I thought it would be wonderful to include my choice as part of my style inspiration. If you know me, you will know that I love day activities and this dress is the ultimate romantic spring daytime dress, which if well accessorised you can easily wear in the evening too. This dress is the Rica Skater Dress in Grunge Rose by Motel. This piece retails at 42 and comes in sizes ranging from XS and XL. Which is wonderful as they cater to all sizes. It comes in 8 different designs, ranging from polka dot, floral or even animal print. 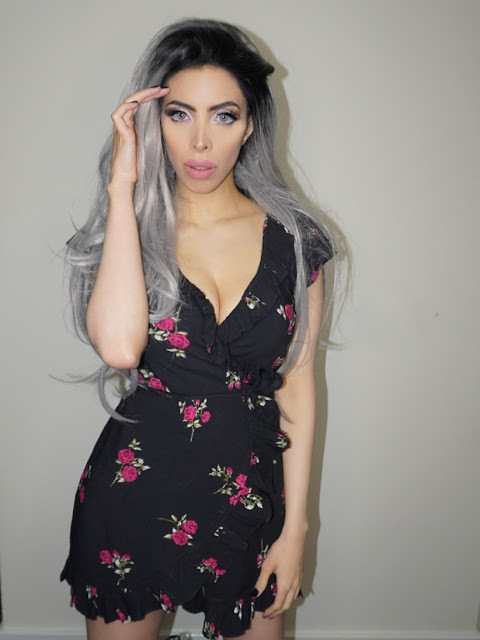 I opted for a dress you could potentially look to wear for Valentines Day or you could even wear for dates in general or any other occasion as a mater a fact. I am very much of the opinion that a romantic look is very pleasing to the eye. You will tend to look naturally beautiful and effortlessly stylish. The material of the dress is 100% Viscose. I really like this floral theme. The dress exhibits a high waist fit which I completely love as it will ecxentuate your waistline. It is a wrap around dress and has ruffles as a feature on both the neckline and the skirt hem. Them is asymmetrical and makes your legs look longer. I love the colour of this particular dress as it is a black dress with maroon and crimson red shaded roses. There's so many ways this dress can be styled to look ideal for different activities, however I am going to opt for a romantic look which you can easily take from day to night. When I received the dress I panicked a bit as the material looked unruly however once I ironed the creases out it just looked exactly as what the portray on their website. For a more casual look you may wear sneakers, pumps or wedges. For a more edgy look I would chose to wear the boots portrayed in the pictures. Don't forget that you may want to accessorise with a hat or jewellery. I think this dress can be worn as well with a black leather jacket. I can say that I am completely in love with this very dress, it looks incredibly beautiful, fits perfectly on your body making the waist very evident. Such a cutie pie dress that will knock people off their feet. This dress made me feel confident, the material is very light so do bear that in mind when you purchase it. You may wish to pair it with a faux fur coat or sleeveless jacket. I advise you to iron the dress and the frills down so that it can look like it did on me. Can you picture yourself twirling in it and swooping your partner or potential one off their feet? The unanimous response I got wearing this particular outfit was of complete and utter appreciation. Get ready to get a series of compliments. For those who are sceptical and may think photoshop enhanced the dress I hereby produced a video of it. Did you already start to think what you could potentially wear on this day of Love celebration? What are your thoughts on this look? I would love to know your thoughts on this look,so please feel free to comment below. 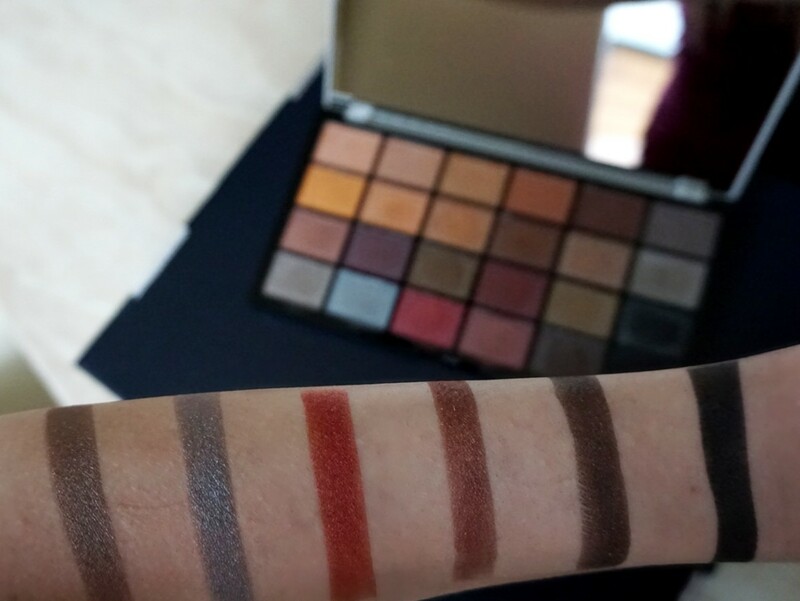 Makeup Revolution has grabbed my attention as of late and I was dying to test out their palettes. 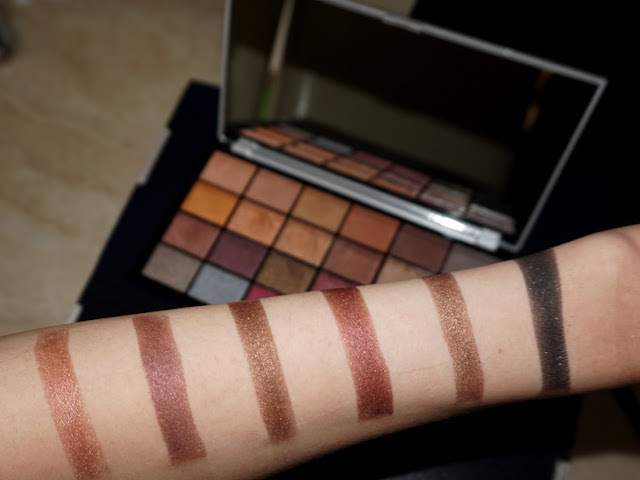 This palette is 1 out of the 4 palettes in their Life on the dance floor collection. I did want to purchase the other 3 but unfortunately they were all out of stock. 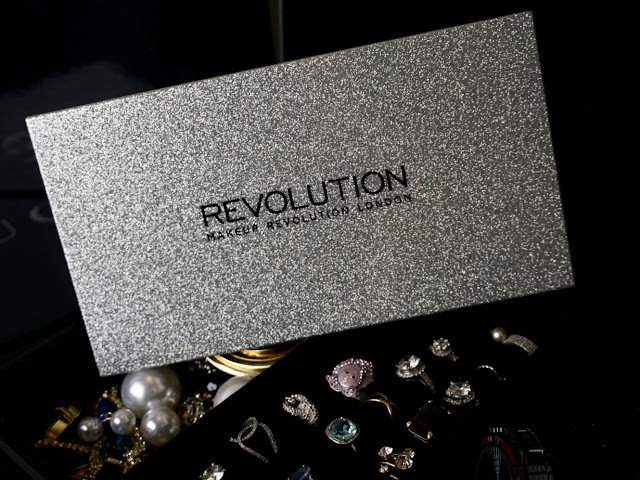 This palette is encased in a silver glitter rectangular compact, which encases a full size mirror. The great thing about the mirror is that it is large and has a high end feel. I am impressed with the quality of the packaging considering the retail price. The mirror is perfect also if you need a mirror whilst on the go. 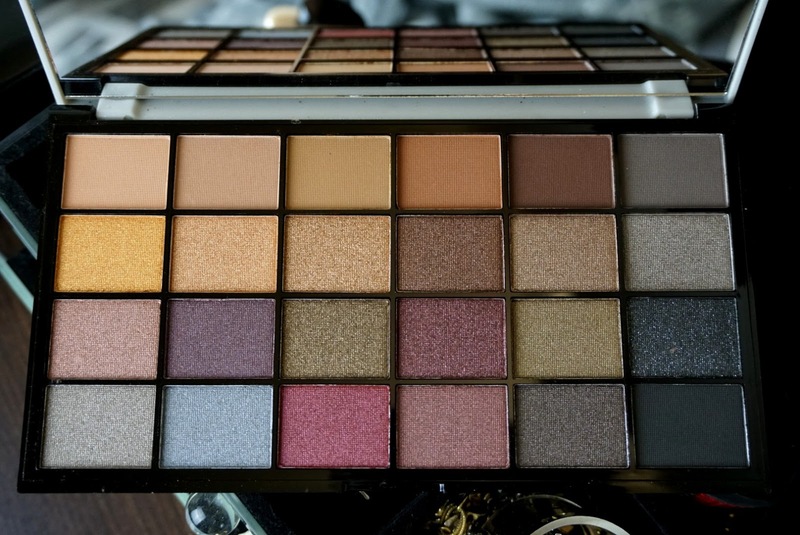 The palette consists of 24 shades. The top 6 shades are of a matte consistency which allows them to be used as transition shades. The next 3 horizontal rows exhibit shades which are of a shimmery consistency to be used on the lid. 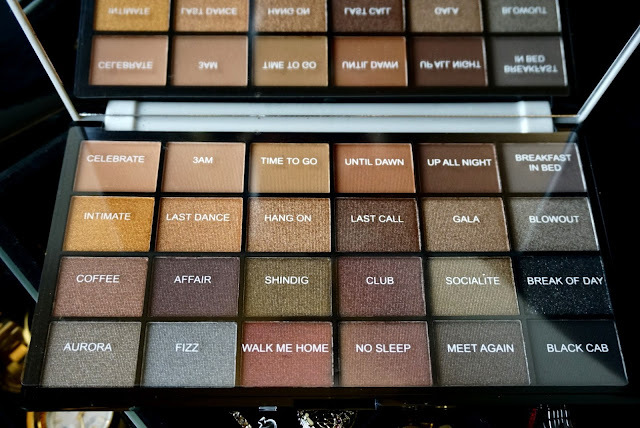 This palette can be used to create both day and night looks, however this palette is best intended for creating striking looks for going out or to events. These were very velvety and creamy in consistency. 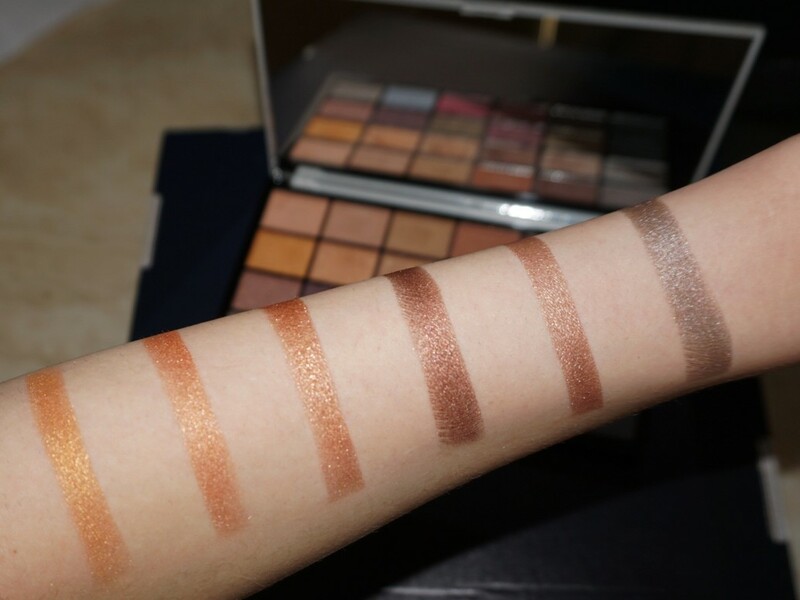 I found that CELEBRATE, 3 AM and TIME TO GO (the first 3 shades) were not very pigmented but easy to build up, it took 3 dips to get the same consistency as UNTIL DAWN, UP ALL NIGHT and BREAKFAST IN BED (the last three) which were very pigmented as I only dipped into them once. I did notice some fall out with this whole row, the most evident one seems to be UP ALL NIGHT. 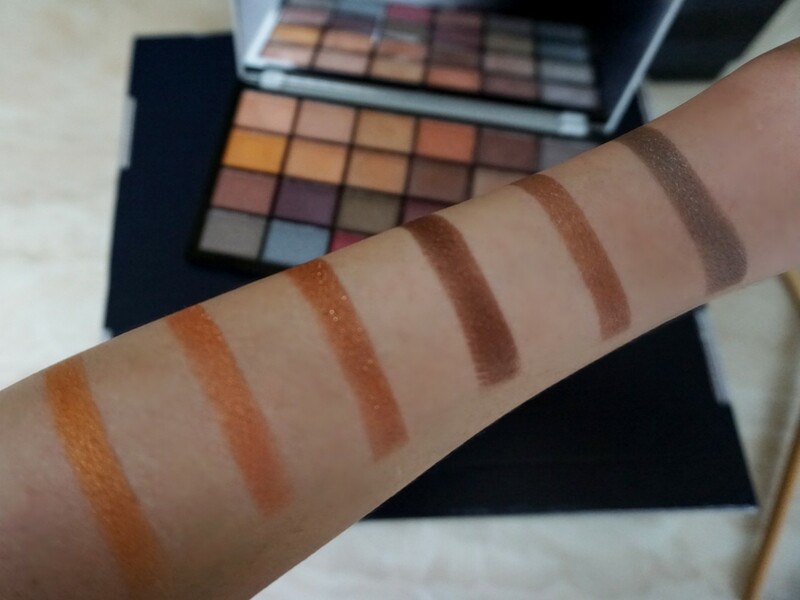 I can't tell you how impressed I was with this row, all shades are shimmery but not a cheap type of shimmer, I am talking expensive, highly pigmented except BLOW OUT (last one), which I had to dip in twice. I did not even have to wet the brush to get the consistency in the pictures. I am in love with the shade and this formula works really well, which I actually was not expecting. Again these had a cream to velvet feel to them and unlike the first row fallout was not noticeable. I did try to see if wetting the brush made any significant difference but none whatsover. It held out wonderfully. I did find that BREAK OF DAY had a fair amount of fallout. These row did was easily transferable especially SOCIALITE and BREAK OF DAY. All the shades were extremely creamy in consistency except for BREAK OF DAY which was almost like a dry powder. 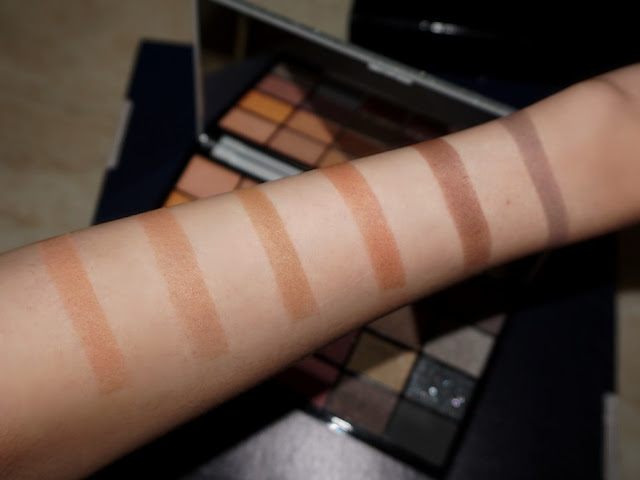 I noticed that FIZZ, WALK ME HOME AND NO SLEEP, were not as pigmented as the SECOND and THIRD PALETTE ROWS, as I had to dip in a few times to get the same colour consistency as the others. However, WALK ME HOME, is my favourite shade, as soon as I swatched it I was instantly in love. BLACK CAB is a considerably black pigmented powder, however there was quite a fair amount of fallout with it. Fallout was present with MEET AGAIN. The consistency of this row was a bit lighter than the others rather than a deep velvet one. I can't believe how well they blend. It is actually a great formula at a fraction of the price. It did last me all day, which was sensational, as I have tried other drugstore brands who tend to fade. However, the pigments kept there strong colours. 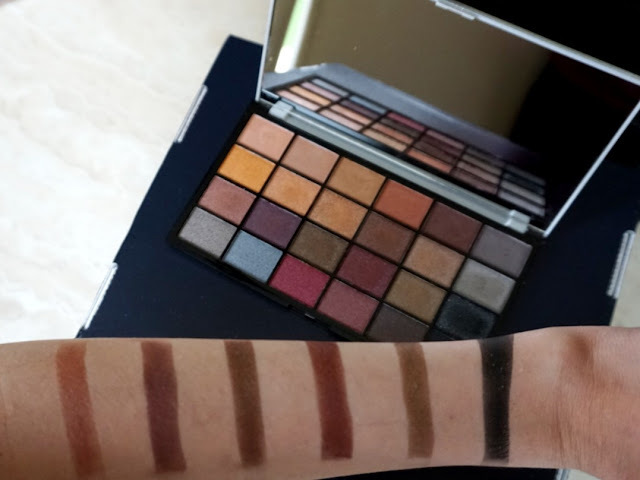 I did recreate two looks with this palette, one is a very natural everyday look and the other is more of an evening look. 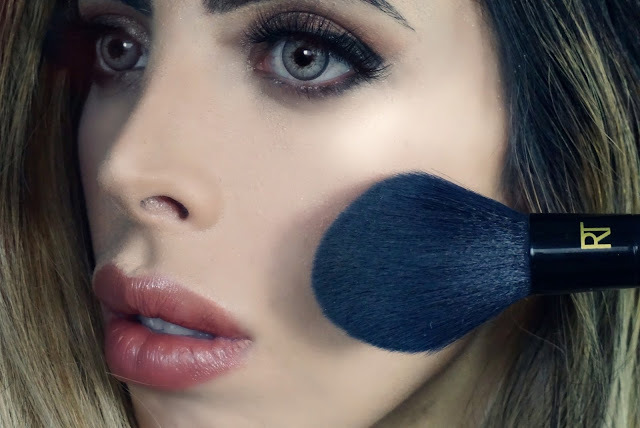 I have created a YOUTUBE video for my evening look for those who would rather see the palette in action. Considering that this palette retails for £10, I am totally flabbergasted. 24 shades for this amount, is too little, as you get so much variety and so many colours you can easily work it. 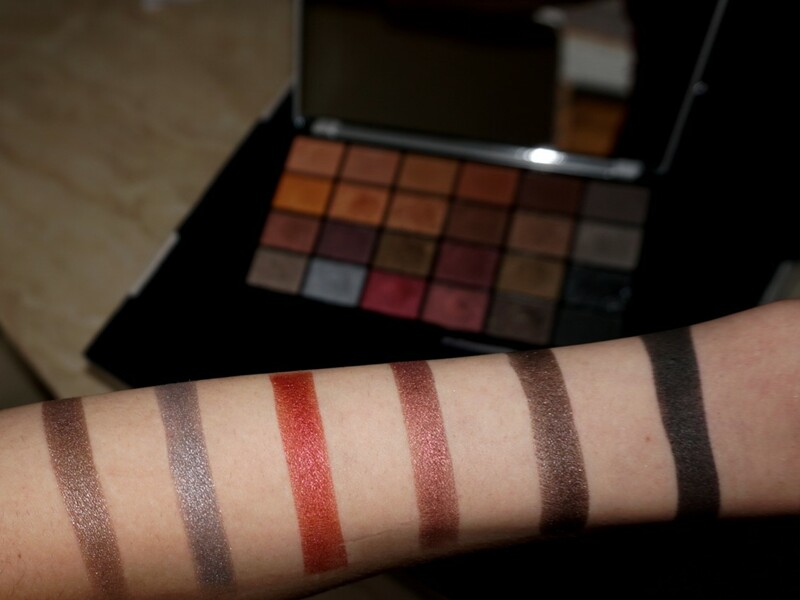 Did you look at those swatches? They are to die for. 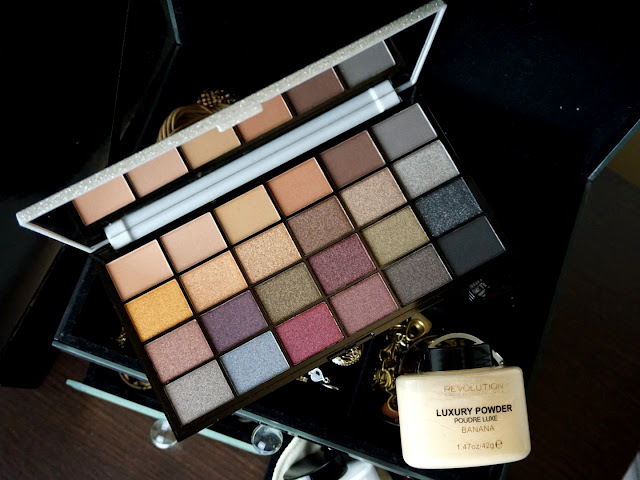 I am extremely impressed with quality, I have encountered luxury brand palettes who charge 6 times more and not as high quality as this one. 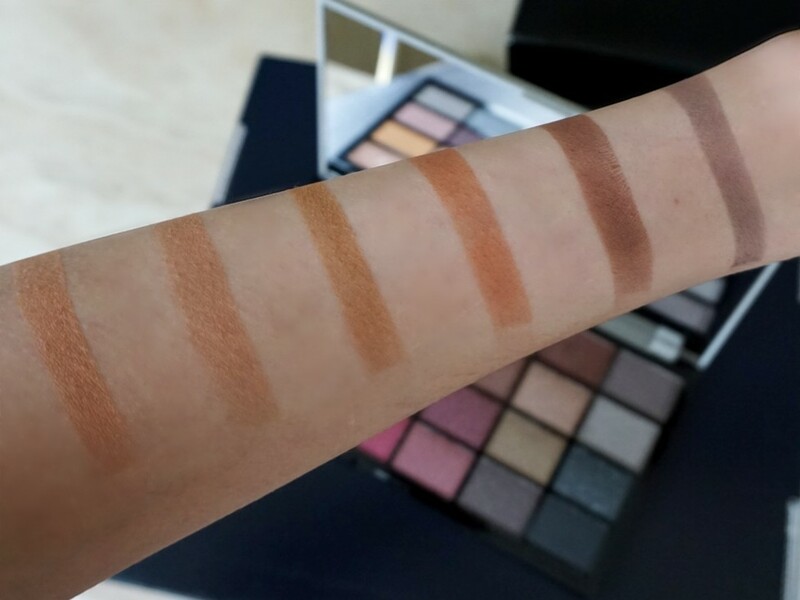 Yes, only a few shades have fallout but not any more than other palettes. 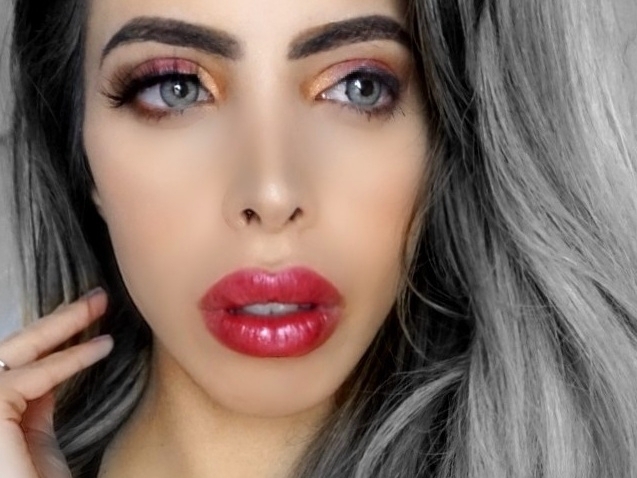 Look at all the looks you are able to create with it and I am not a professional make up artist. This is such a great palette for the holiday season. I am in love with those shimmers and excited to create more upcoming looks. Ever wondered how to get the perfect look for the party season? Look no further. 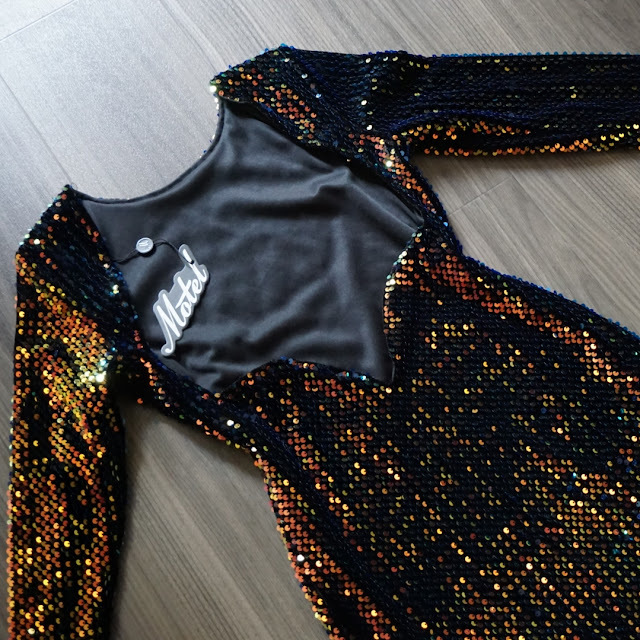 I think I was born to sparkle there is nothing I love more than a dress with sequins, crystals or basically anything that shines, because let's face it why go for a plain dress when the party season is in full swing. 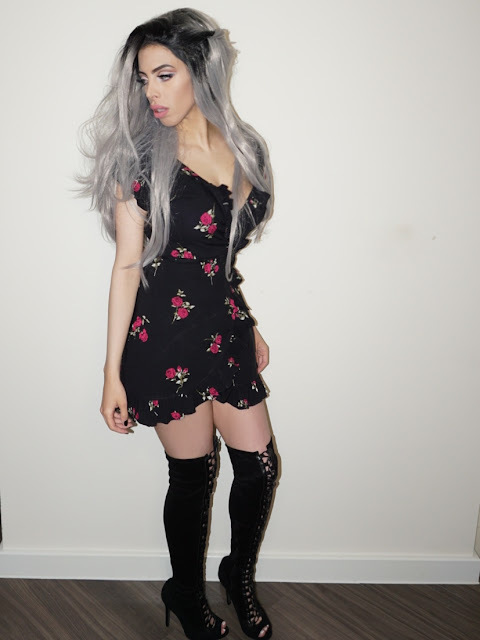 I was provided a beautiful dress by Motel who is known also as Motelrocks . I can finally unveil it for the new year and what better way to start off 2018 in style. Then again, what makes Motel any different from most online retailers? 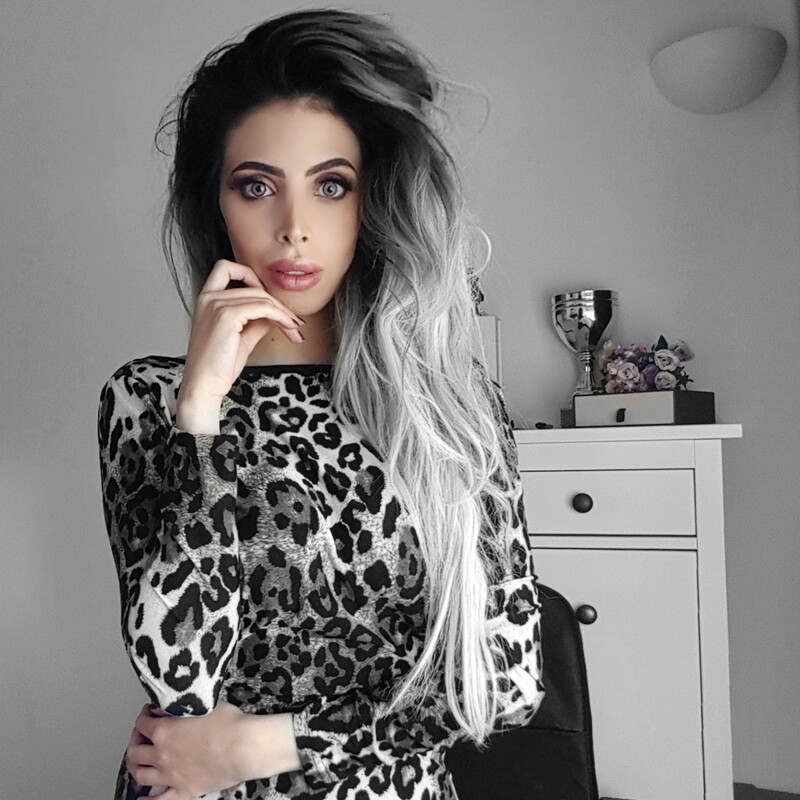 This is a brand which is leading in the British fashion industry when it comes to providing high quality, edgy and unique prints. I love that they actually have different types of items in comparison to other brands and set their own fashion niche. I will let you in on a little secret. The best part is that this is the go to place for unique clothing so if you have a phobia of someone turning up at the same party with the exact same dress, it is highly unlikely to happen with Motel. I was given a choice of irresistible dresses to chose from and I will tell you one thing, it was truly a task to make a choice. Nonetheless, I chose the Gabriella Dress in Prism Shine Sequin. I was drawn to it as it looked expensive, perfect for the New Year festivities as you could tell it was something which would make me stand out in the crowd. I knew I was in for a treat as I have seen renowned worldwide influencers wear this clothing line. The dress was beautifully packaged and as soon as I took the dress out of the packaging, I was left pleasantly surprised , the dress was beyond beautiful. It also had an open back which I adore. As I mentioned earlier I chose the dress from a set of photographs and the dress looked green with a hue of copper as the lights reflected on the sequins. It couldn't be further from the truth , the colour was beyond all expectations because picture this if the light hits in from one angle the dress looks a dark emerald green colour however, if the lights hits it from another angle it looks like it is of a deep copper colour. Can you imagine wearing this at an event? or celebration? Well I could, I had already pictured myself entering the venue as I sparkled and the light shining off the dress during the evening, girls being unable to keep their eyes off it as it was deceiving them as they saw green or copper. Tell me, you are not drawn to in now? I could already picture how it would look on photographs. I was truly excited. With New Year at it's doors what better dress to crown the end of the year with and begin the next. I have made it no secret to those who follow my blog that I have reached a weight which is healthy so I was eager to see how the dress would fit me because there is nothing worse than a loose dress to me, I noted that the dress was an S and I would say that currently I am between a UK size 8 and 10 depending on the brand. As I slide into the dress I start to notice how easy it was to get into and how beautifully it hugged my curves. The fit is perfect and it is incredibly well made. We all know that sequins may shed but luckily I did notice any shedding. I truly loved getting to wear this dress and to be honest the amount of compliments it got me was overwhelming. So this is how I shined bright like a diamond during the New Year festivity. I couldn't get over how affordable the dress was. I am definitely excited to try more clothing soon from them as they are officially my go to online retailer. If you are looking to shine but maybe this exact outfit is not the one who tickles your fancy you may want to look at the other dresses or clothing which fits best your style.